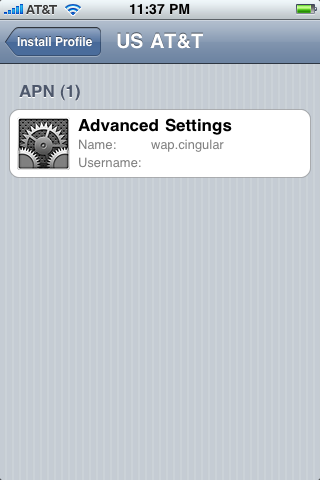 It turns out that the iPhone is capable of installing network profiles from MobileSafari. Since all of the recent tethering hacks have used a modified network profile to enable tethering, BenM.at has created a pretty easy to use page to enable this feature, and supports practically every iPhone provider out there. The process is very simple, go to http://help.benm.at/help.php, scroll down to Tethering & Internet Settings, tap on the Mobileconfigs download link, choose your country and then your provider. 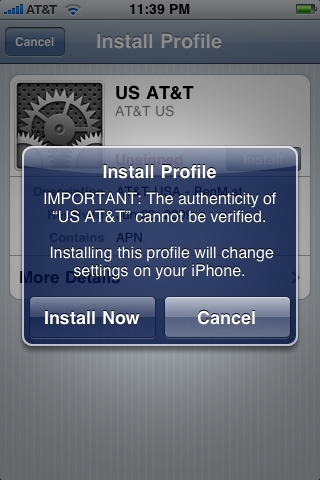 The network profile installer will launch and allow you to update your iPhone settings which will enable tethering. To enable tethering just go to Settings, General, Network, tethering should now be an option. I currently have a first generation iPhone, and since it doesn’t support tethering or MMS I wasn’t able to try this myself. But, Jason Chen of Gizmodo says that they have been testing it for about a day and it has worked fine for them. I haven’t dug very deep into the MMS enabling features, since they are currently beta and the method to install it is a little complicated. I really wouldn’t advise anyone to enable MMS until they make things a little bit easier. Gizmodo – Enable Tethering On Your iPhone 3G and 3GS With Only Safari MMS, VV Fix – Iphone tethering. 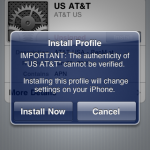 Update 6/25/09: I dropped by an AT&T store yesterday and installed tethering on one of their demo devices. I wasn’t able to test tethering but I can say that everything else on the phone worked just fine after installing the network profile. Update 7/14/09: There are some reports that downloading the mobileconfig files (as explained above) still works (@andrewe) with iPhone firmware 3.1 beta 2 but there are also some reports that the IPCC tethering trick no longer works. I can’t confirm whether or not either one of them work because I don’t have access to the beta firmware. Update 7/31/09: Firmware update 3.0.1 hasn’t broken this tethering hack. We already know that 3.1 will, so 3.0.1 might be the last firmware that will allow you to easily enable free tethering. Update 8/3/09: According to iPhone Alley firmware 3.1 beta has already enabled MMS, so it is likely that MMS will be enabled for all iPhone 3G and 3GS users with the final 3.1 update.